Digger, listener, runner, Prince with the swift warning. Be cunning, and full of tricks, and your people will never be destroyed." The “follow the white rabbit” sync continues to reoccur with social-medic voracity. Our last post, highlighted the distinctly Oregonian "giant rabbit" version of such. Many have noticed or been troubled by the most recent, conspiratorial manifestation is this, indicated by the #FollowTheWhiteRabbit mind-virus. Reportedly appropriated from Lewis Carroll’s book Alice’s Adventures in Wonderland, this hashtag will take the unsuspecting down some pretty dark rabbit holes indeed. Example: Apparently, some Alt-Right Twitterheads are using the hashtag in referencing a supposed Alice in Wonderland-themed party that Obama threw in 2012? In this scenario, Obama is apparently Alice… I’m sure there is some nefarious connotation unmasking some globalist elite here, but its significance eludes me. Many of the tweets that use the White Rabbit hashtag also reference the mysterious entity: QAnon or simply “Q.” According to the completely reliable scholarship of Reddit… it stands for an anonymous person or persons who claim to have Q-level security clearance. This persona, posts theories about biblically referenced prophecies and the resulting sequence of events that are supposed to not only rid the world of evil... but take down a few very powerful Illuminati families in the bargain… signing “Q” at the end of each tweet. 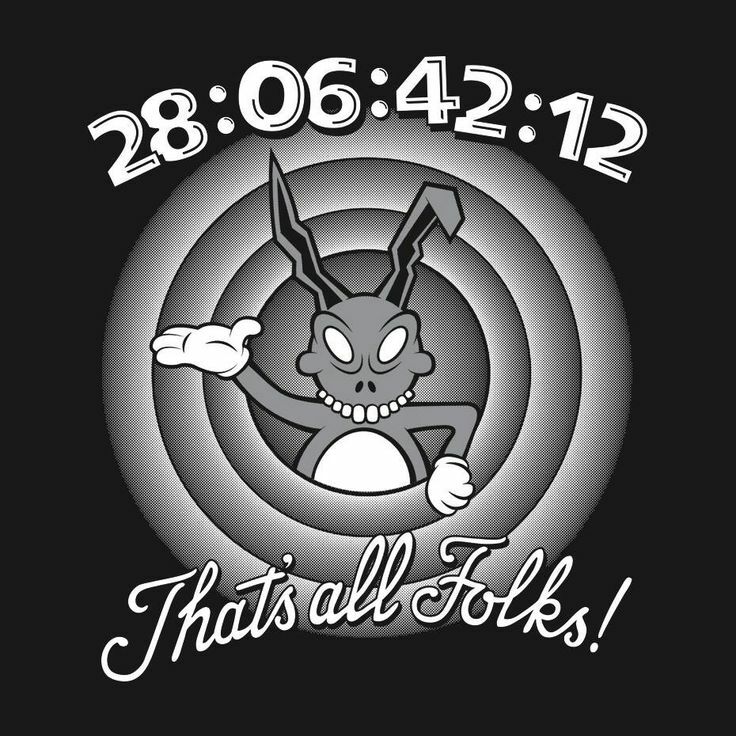 This reference to Lewis Carroll’s Alice in Wonderland becomes a recurring theme in the Matrix. When our hero Neo meets the archetypical Wiseman: Morpheus… he poses the film's pivotal question to Neo: “I imagine that right now, you're feeling a bit like Alice. Hmm? Tumbling down the rabbit hole?” Morpheus proceeds to offer Neo a chance to wake up from the illusion that is the Matrix: “This is your last chance. After this, there is no turning back. You take the blue pill… the story ends… you wake up in your bed and believe whatever you want to believe. You take the red pill… you stay in Wonderland and I show you how deep the rabbit-hole goes." This encounter between characters in a film denotes the turning of a dark corner in the very real world of contemporary high weirdness. This was the moment when “going down the rabbit hole” entered the lexicon of the fringe. No longer did this reference conjure the whimsical world of Carroll’s Alice… nor did it even convey the psychedelic connotation of Jefferson Airplane’s White Rabbit. At the dawn of the new millennium, the term “rabbit hole” was now evocative of computer surveillance and impending Artificial Intelligence... was now synonymous with an emerging networked global conspiracy. How deep the rabbit hole went, was indicative of how far the conspiracy reached. …is an old superstition found in Britain and North America that states that a person should say or repeat the word "rabbit" or "rabbits", or "white rabbits", or some combination of these elements, out loud upon waking on the first day of the month, for doing so will ensure good luck for the duration of that month. In some cultures, the foot of a rabbit is carried as an amulet believed to bring good luck. This belief likely has existed in Europe since 600 BCE among Celtic peoples. American lucky rabbit's foot folklore may have originated in the system of Afro-Caribbean/American Gulf Coast folk magic known as "hoodoo". In regard to this lucky charm or other such talismans: Depend on the rabbit's foot if you will, but remember... it didn't work for the rabbit. The púca (Irish for spirit/ghost), pooka, phooca, or púka... is primarily a creature of Celtic folklore. Considered to be bringers both of good and bad fortune, they could either help or hinder rural farming and coastal fishing communities. The Púca can have dark or staunch white fur or hair. The creatures were said to be shape-shifters which may take the appearance of horses, goats, dogs, or most commonly… hares. They may also take a human form, which includes various animal features, such as the ears of a rabbit. Returning to modernity... 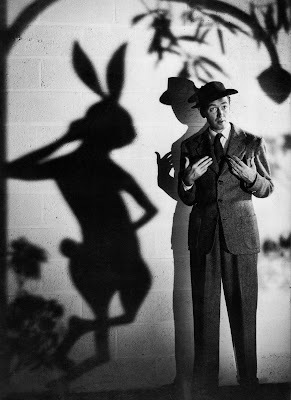 In the 1950 film “Harvey” with Jimmy Stewart, Stewart's character has a 6-foot, 3 1⁄2 inch tall rabbit as a familiar or companion named Harvey, whom he refers to as a "pooka". On July 23rd 1973 author and Discordian High Priest, Robert Anton Wilson, began to have the experience of channeling information from an intelligence in the Sirius star system. 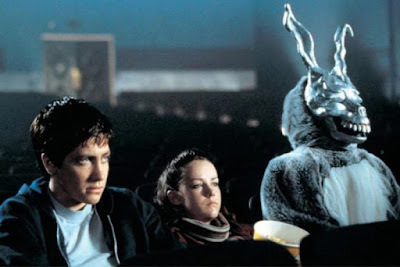 However, he later took a more agnostic stance on the source of these communications, often ascribing these experiences to a Pooka in the form of a large rabbit. Shortly after the release of the Matrix, the now-cult-classic film “Donnie Darko” made its debut in select theaters. Due to the film's advertising featuring a crashing plane, and considering the September 11 attacks that transpired a month before, the film was scarcely advertised. ...is an urban legend that probably originated from two incidents in Fairfax County, Virginia, in 1970, but has been spread throughout the Washington, D.C. area. 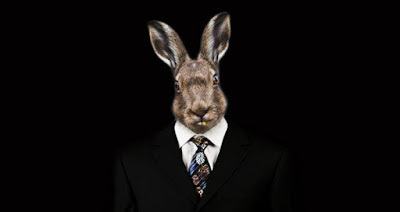 The legend has many variations; most involve a man wearing a rabbit costume who attacks people with an axe or hatchet. 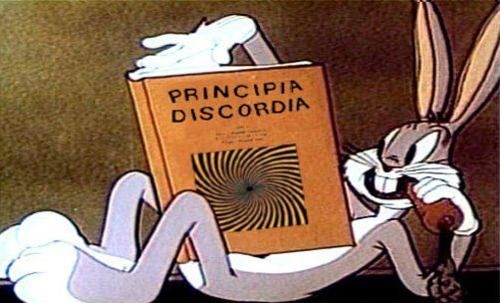 The common thread of the above examples, point to the folk/occult nature of the broader Rabbit Meme. Historically, the lucky rabbit’s foot charm originated from medieval practices of the craft. A rabbit is an animal into which shape-shifting witches such as Isobel Gowdie claimed to be able to transform themselves. As such, the true lucky rabbit's foot was allegedly, if not allegorically cut from a shape-shifted witch. The suggestion that the rabbit's foot is a substitute for a part from a witch's body is corroborated by other such folklore from hoodoo. It can be argued that the most prolific “rabbit holes” of the information age are social media platforms such as Twitter and Facebook. However, it is realm of the occult and the occluded that is of interest to the synchromystic community. It is through mythic and mystic means that intuitive information is “made available” to us. Beware the pitfalls and time sinks of social media, but stay alert for the synchronicities of re-occurring, archetypical memes. 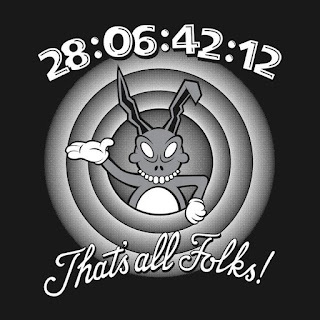 Watch for the White Rabbit. Who knows what synchromystic connotations may arise?